We providing a sample experiment to practice your skills on the psychology. Follow the below experiment rules they will help you..
Look at the image below and say aloud the color of each word. Do not read the words! Just say what color they are. Was it more difficult that you expected? In this demonstration, you experienced what is known as the Stroop Effect. This term refers to a phenomenon in which it is easier to say the color of a word if it matches the semantic meaning of the word. For example, if someone asked you to say the color of the word "Black" that was also printed in blank ink, it would be much easier to say the correct color than if it were printed in green ink. How Does the Stroop Effect Work? · Selective Attention Theory: According to this theory, naming the actual color of the words requires much more attention that simply reading the text. 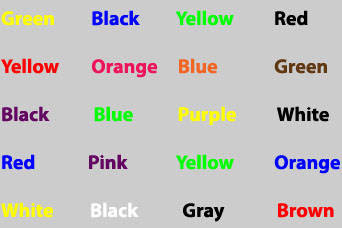 · Speed of Processing Theory: According to this theory, people can read words much faster than they can name colors. The speed at which we read makes it much more difficult to then name the color of the word. Before you begin your experiment, there are some key terms and concepts you should understand. · What other variables might impact reaction times? · Compare reaction times among different groups of participants. Have a control group say the colors of words that match their written meaning. Then, have another group say the colors of words that differ from their written meaning. Finally, ask third group of participants to say the colors of random words that do not relate to colors. Then, compare your results. · Try the experiment with a young child that has not yet learned to read. How does the child's reaction time compare to that of an older child who has learned to read? · Try the experiment with uncommon color names, such as lavender or chartreuse. How do the results differ from those who were shown the standard color names? You can find more tips and advice in this article on how to conduct a psychology experiment.